Lester A. ‘Booger” Witthuhn – age 92, of Hays, Kansas died Wednesday, September 5, 2018, at Hays Medical Center. He was born February 24, 1926, in Bazine, Kansas, to Richard William and Amanda (Michel) Witthuhn. He married Betty (Houser) at Bazine in 1945. She preceded him in death on March 8, 1979. He married Elaine Elizabeth (Wnek)-Wilson at Oklahoma City, Oklahoma, on February 20, 1981. 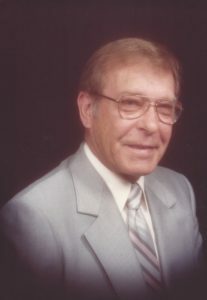 Survivors include his wife, Elaine E. Witthuhn, of the home; three sons, Lester “Butch” Witthuhn and wife, Mary, Hutchinson, KS; Tim Wilson and wife, Wendi, Ft. Myers, FL; Davis Wilson, Acworth, GA; four daughters, LuAnn Gore and husband, Steve, Palmyra, PA; Louise Roy and husband, Randy, Abilene, TX; Debbie Boehler and husband, Steve, Oklahoma City, OK; Jackie Fitz (Brian), Gibsonton, FL; three sisters-in-law, Doris Witthuhn, Hays, KS; Pat Cmunt, Stickney, IL; Carolyn Houser, Newcastle, OK; 18 grandchildren, Jeff Haas, Chris Haas (Ursula), Blue Haas, Steve Gore Jr. (Kelly), Staci Albert (Jordan), Andrew Roy (Julissa), Adrian Roy, Dessiree Mundell (Chris), Daniel Witthuhn (Rebecca), Brayden Witthuhn, Matt Boehler (Jessica), Alexandra Wilson, Zachary Wilson (Shannon), Chris Wilson (Julie), Tim Wilson, Julia Bohlander (Austin), Casey Fitz, Hayley Goodwin; 21 great grandchildren with one on the way; and many nephews and nieces.